I used Cricut Cartridge Art Nouveau and cut one of my favorite cuts. The ivory background cut is from Pretty Pennants. Not just for pennants you see! I inked the edges of the flowers and stems and my fingernails! I love the look that peach and lavender have when you use them together. Add some ivory and this is such a soft and beautiful look. When a Tulip you see, please think of me! 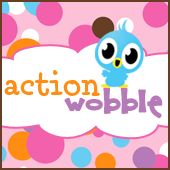 Have you gotten your Action Wobbles yet? You can order them HERE! Love this card. Please give me the location of the intertwined tulips on Artiste cartridge. I can't seem to find it anywhere. Thank you. OMG!!! It is Art Nouveau not Artiste!!! My error!! That's what I get for posting so late after a hard day at work. You're a rare bird on a wobble.